At the ECHO seed bank, bad/damaged seeds are sorted from good seeds. But does it really matter? Won’t damaged seeds still germinate? In order to answer this question, samples of sorted cowpeas were put into a direct-seed germination tests on 12/2/2016. The first sample was plump, healthy seeds, the second was insect damaged seeds, the third was cosmetically damaged seeds, the fourth was severely shriveled seeds, and the fifth was moldy and damaged seeds. 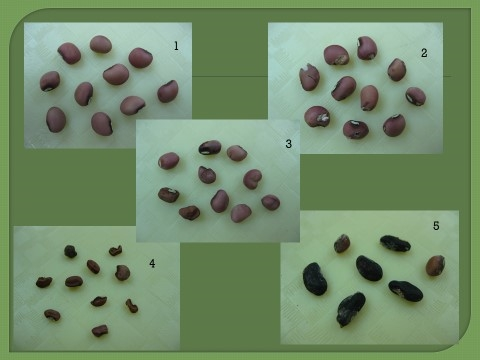 Samples 1-4 included 10 cowpea seeds each and sample 5 included 8 cowpea and yard long bean seeds (only 7 pictured). On Monday 12/5, germination was checked. Some of the first seeds to germinate were the insect damaged seeds in Sample 2. This is probably because the seed coat was already scarified by insects, thus allowing the seed to imbibe (uptake water) quickly. The healthy seeds in the first sample were also some of the first to germinate. On Thursday 12/15, a count of germination seeds was taken along with photos of the seedlings. 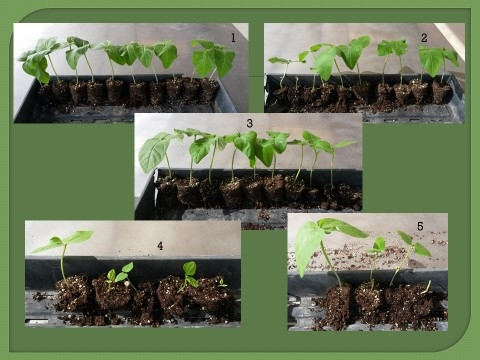 Recorded observations (shown below) indicate that, although damaged seeds may still germinate, they may not all produce healthy seedlings. Shriveled, moldy seeds may not even germinate well. These results illustrate the importance of sorting seeds to screen out damaged/unhealthy seeds. Keep in mind that seeds need sufficient food reserves (lacking in seeds that do not attain a normal size) and viable embryos (sometimes damaged by insect pests or threshing activities).